Growing up I remember the clamshell Disney VHS tapes that seem to be everywhere in my house. Those cases were unlike any other in our VHS collection with their white cases that you opened like a book vs. the sleeves that all the others had. My collection was modest, but I know of friends who had every movie ever released by Disney, every time one was released from ‘the vault’ a brilliant marketing tool, you almost had to buy it. Now it seems that Disney is pulling those classic VHS tapes off of the shelf and making a live-action version of every movie in their catalog and so far they have done very well, but the latest Dumbo asks the question, should all of them be remade? In my eyes Disney took the easy road first by doing films like Cinderella and Beauty and the Beast, but now comes the challenge, with this one up, we get everyone’s favorite flying elephant Dumbo. The story goes something like this, a baby elephant is born, but with a unique feature about him, he has over sized ears and they are not the better to hear you with kind. Instead he becomes something to be laughed at, that is until it is discovered that those ears allow him to fly, with the help of a feather. Soon Max Medici (Danny DeVito) sees dollar signs and assigns Holt (Colin Farrell) to be his trainer with the help of his kids, who were the ones who discovered the flying ability. Whenever someone has something special it is bound to get attention. The eyes set on Medici’s circus is V.A. Vandevere ( Michael Keaton), a man with a vision of what Dumbo could be, so he makes Medici an offer he can’t refuse. And what seemed like a good home, was discovered to have other intentions, but will it be too late for Dumbo to get away? I have to say the thought of Tim Burton and Dumbo had me excited, I mean was this going to be a good Tim Burton movie finally, or just another let down. Well I am here to say this is Burton’s best film in years, but with the caveat that he has set his bar a bit low in recent years, so take that with what you will. 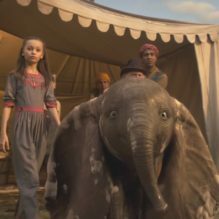 I am going to come out and say, Dumbo is not a bad movie at all, but at the same time it is also not a very good movie either. The cast is great, and it was enjoyable to see DeVito in a role that was all too perfect for him. Besides him Keaton was good as always, and Farrell as well, who is always seems to pick the right roles. Where things go wrong is the feeling the film gives you. It doesn’t play out like the story was told with any love, but instead with dollar signs in mind, and that is no more evident in the use of Michael Buffer, you know him, the “Let’s get ready to rumble!” announcer guy. That made me slap my head when I saw it. There was no other moment that summed up the point of this reboot than that scene and for me that took a lot of shine off the finished product. There will be plenty of people that love this version, I am not one of them, but I enjoyed it enough. I know they can’t all be home runs, but in my eyes, Dumbo barley makes it to second, or in terms better suited for this movie, it takes flight, but the landing is anything but graceful.